The language around birth has changed, too, notably around gender. Today, we know that gender is fluid and nonbinary. Referring to the birthgiver as a woman or a mother, and the partner as the father or a man, or even to assume that there is a partner in the picture, feels exclusive and arcane at this point. We want for everyone to know that they are welcome. We have changed our language accordingly, in alliance with our friends of every walk of life. Many people came together to support this program’s re-birthing process, and I want to share a little bit about the journey to its completion. I am so deeply thankful to the community of teachers who pulled together to advise and edit the meditation scripts by phone, in person, and on the trusty Google Suite. I spent a glorious weekend in Ashland with Robert, reading and revising the scripts, ensuring that we were staying true to the ancient wisdom as we modernized the language. We nitpicked the scripts til we could pick no more… and then production moved into the studio. I’m lucky enough to have access to a sound studio, but I’m a total novice. After several frustrating fails, both with my own voice and with the equipment, I was ready to give it up and find someone else to take over. But then a conversation with Robert reminded me of what I was really doing with these recordings: I wasn’t just talking into a microphone. I was transmitting the words of the Calm Birth community and the deep tides of the sacred lineage that we carry in our voices and hearts. We couldn’t hire just anyone to record these tracks. I’ve been living and breathing these meditations for five years, and I was the right one to do it. With this in mind, I set myself up to record with womb breathing, and the strong intention to empower births with the words I was about to say. I imagined that I was speaking directly to a doula client facing the joys and challenges of childbearing. Each word was infused with hope and love. At the end of each track, I felt revived, coming out of my own powerful meditation. And the end products sounded different. Where listening to my own voice had once been torture, these matured tracks soothed me. I figured that if they could relax even me, my own worst critic, this was a good place to end the recording and begin the editing. As it turns out, sound editing is easier said than done. Did you know how many tiny sounds your mouth makes?! I don’t recommend finding out. After some absurdly late nights spent trying to edit all of the recordings, I accepted that I needed more help. I contacted a friend in Australia to see if she could lend her professional hand at final edits. To my delight, she edited the tracks to near-perfection and added soft, angelic music to the background, taking the recordings to a whole new level. With the recordings complete, I just needed a place to put them… again, easier said than done. Again, I tried to do it on my own… and again, someone from our community stepped up to the plate. This time, it was my darling boyfriend, Jake, whose job as a software engineer had always been somewhat enigmatic to me. I didn’t realize that he could literally make something out of nothing. Together, we entered a creative flow state, losing track of time as brainstorms over dinner segued into manifesting our ideas into reality from a computer screen. We realized that we could have this app finished by the APPPAH congress, and pushed hard to make it happen. Finally, the Tuesday after Thanksgiving, and two days before I was to fly to San Diego for the congress, the app was released. Since our application had been accepted, I’d been checking the app store obsessively. Our logo appeared on it just as Jake was picking me up from work. We screamed and hugged and I cried a little: so much love had been put into this, and at last our program is available to anyone in the world. As I write this, I am on the airplane to APPPAH, where I can’t wait to show it to people who have supported Calm Birth for so many years. This app is a culmination of our community, with its diverse perspectives and talents. We still have so many ideas, but for now, I think this app is really elegant in its simplicity. Three tracks, ten minutes each, accessible from anywhere. 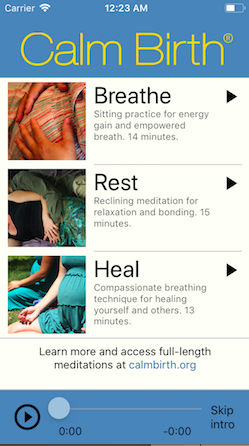 For a meditation app, what more do you really need? And now, a call to action: Readers, please take a moment to support this app! All we need from you is a rating and review, from iPhone or Android. The more we receive, the more people it will reach. We really look forward to moving far into the future with all of you… the best is yet to come.